The USS Missouri is the fourth ship and the second battleship to bear the name of the “Show Me” state. The ship was the last battleship commissioned by the United States, and in 1992 was the world’s last operational battleship. It provided gunfire support for many famous and important battles of World War II. On September 2, 1945, the ship was chosen to be the stage for the signing of Japan’s Formal Instrument of Surrender, bringing an end to the war. Today visitors can see the room and table where the peace treaty was signed. 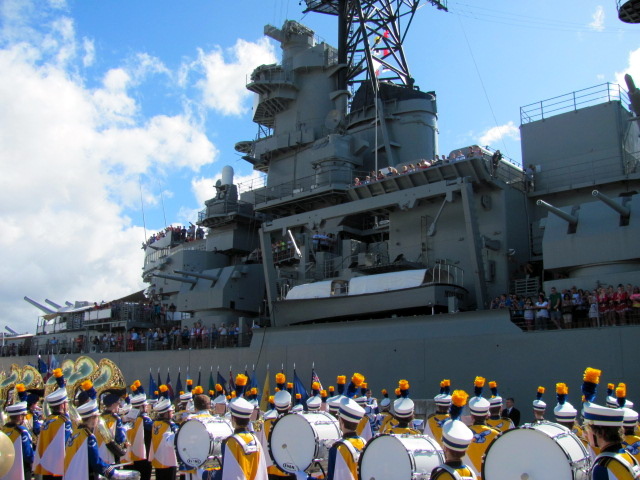 Your performance at the USS Missouri Battleship will be a highlight of your week on Oahu. A tribute to our nation’s history and heros, musically and historically, it is the culmination of all that students prepare and learn for this trip. With the USS Arizona Memorial as a backdrop, audiences enjoy your music from the many decks of the “Mighty Mo”. A group photo in front of the battleship is included for all tour participants. You will have an opportunity to explore the ship on a self-guided tour, with lunch provided on the grounds of Ford Island. Performances may be up to 30 minutes in length consisting of patriotic, military or period repertoire. To see photos and videos from performances at Pearl Harbor, visit the Photos & Videos page.